Cover to the story's reprint in Super Mario Bros. (Volume 2) #1. 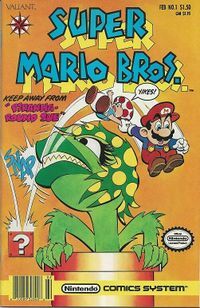 "Piranha-Round Sue" is an issue of the Super Mario comic series published by the Nintendo Comics System. Its name may be a pun of the song Runaround Sue. The story begins with Mario and Toad rushing into King Toadstool's chambers, claiming the Piranha Plants are revolting. Mario doesn't realize that the King has been turned into a chameleon and he needs a magic wand to turn him back into his normal self. The King gives Mario and Toad the Green Gecko Gem, a powerful gem that casts a forcefield around whoever holds it. As Mario and Toad travel to the Piranha Plant headquarters to get the wand, Toad whispers an idea to Mario. Mario bounces through the land using the Green Gecko Gem's protective shield, while Toad falls behind. Piranha Sue, an evil Piranha Plant, pops out of a Pipe and manipulates Toad by telling him he could be the king of the world with the Green Gecko Gem. Mario finds the magic wand and sees Toad about to fall off a waterfall. Toad tells Mario to drop the gem and grab him (though he is secretly being held by Piranha Sue's vines). He eventually disappears under the water, and Mario rushes in to grab him, dropping both the wand and the gem. Piranha Sue quickly snatches the items and powers herself up, exclaiming that she rules the world. King Koopa suddenly appears and chokes Sue, who tries to tell him that she gathered the gem and wand for him. Bowser tosses the gem away, deeming it a cheesy trinket, and reads the inscription on the wand: "Brooklyn Plumbing Novelty Company." Piranha Sue was duped, and ends up presumably getting punished. 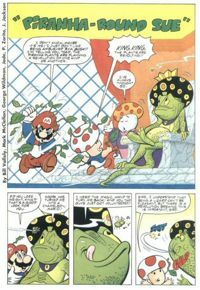 Meanwhile, Toad and Mario return to King Toadstool and turn him back to normal (or as Wooster says, "Only technically"). This page was last edited on May 14, 2018, at 05:47.